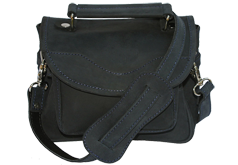 We developed the Mini Satchel after my wife's good friend Kellena suggested it would be nice to have an "auxiliary bag" to go inside her large messenger bag. It appears that she has a tendency to bring everything she can fit in her briefcase, but didn't want to lug the monster into every restaurant or store. She wanted to pull out a mini satchel with only her essentials in it & go. So now she can keep her wallet, cell phone, sunglasses, gum, & cosmetics in her Mini Satchel that fits in her larger bag. Of course it can be used by itself as a purse & looks great for a night on the town. 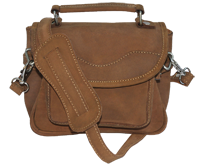 The Rustic Leather Mini Satchel is made of 100% full grain leather stitched with polyester thread that will hold up to water, sun & most chemicals. The four compartments are perfect for organizing your necessities. 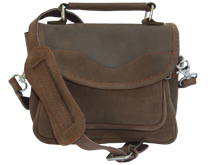 This Rustic Leather bag will just keep looking better & better the more you use it. "Great product and excellent workman ship. This is my 3rd bag from them (briefcase and satchel), and as you can see, I keep coming back."